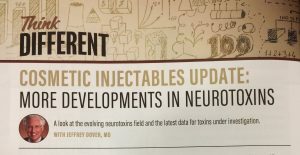 The field of injectable neurotoxins is evolving and growing. But the holy grail of these neuromodulators remains longer lasting results without sacrificing safety. SkinCare Physicians’ Dr. Jeff Dover weighs in on the promising trial data of a new neuromodulator from Revance, RT2000, which effects lasted longer than other injectable neurotoxins currently available. A definite plus for many of our patients!